Perched on a dramatic cliff top overlooking Muir Beach, Slide Ranch is one of those rare rustic gems that combines stunning natural scenery with a down-to-earth vibe. You can say “I do” on its sweeping lawns as you stare out at the Pacific Ocean, then party into the early hours in its traditional Mongolian yurt. With a plethora of breathtaking natural vistas and backdrops for wedding photos, Slide Ranch is the ideal setting for couples who love the outdoors and want a laid-back atmosphere for their special day. Slide Ranch is a non-profit organization, so you know your money is going to a worthy cause. But keep in mind that the operators are not wedding planners, so while they can help you with organization to some extent, you are largely on your own! Situated in the Bay Area, Slide Ranch’s main goal is to connect children with nature, but this is something that extends to people of all ages. 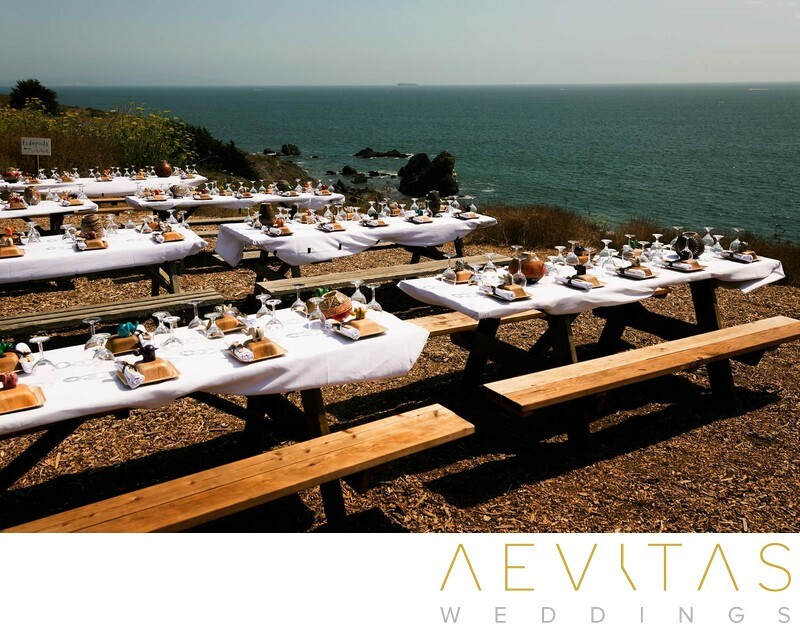 Wedding gatherings here are intimate events, with just your closest family and friends, and as you stand within its stunning wilderness setting, it is hard not to be captivated by the natural landscapes around you. The green ceremonial lawns, juxtaposed against the bright blue ocean, create undeniably beautiful wedding photos, but it’s during the couple portraits that Slide Ranch really shines. Follow the trail that winds down to the beach during the sunset “golden hour”, and take advantage of the whimsical setting within its long, grassy fields. As the sun slowly sinks below the horizon you can also capture magical portraits, backed by Muir Beach’s spectacular rock formations. Wedding receptions are held on the lawns beside the yurt, with long tables set up for guests to enjoy the views as they wine and dine against a spectacular dusk night sky. You have free range when it comes to your choice of catering and beverage options, meaning you can keep costs significantly lower compared to other wedding venues. After feasting on your chosen culinary delights, head inside the yurt where the dance floor awaits, with rustic wooden features and Christmas lights adding a vintage touch. Slide Ranch has a remote feel about it and that’s what makes it so special. It’s perfect for couples wanting that end-of-the-world atmosphere, whilst still being accessible for your family and friends. Make sure your guests know that it is a short hike (about a quarter mile) from the carpark to the ceremony site, and as nighttime temperature can drop, advise them to bring warm clothes to rug up.